Was this your school, do you know when this photo was taken? This page was added on 18/10/2010. Have some great memories of our school too. Lol. I lived in Ashburnham drive and went little furze in the late 50’s. Remember it well. I live in Cambridge now so haven’t seen it for few years. Hello Peter Nangle-your parent’s house to the right of ours-we were 6.We shared a short covered walkway to our two back gates. Lovely to have news of your family. Hi, I started school here in 1958 , I was born in Ashburnham Drive, No 38 I think, backing on to the playing fields, and then we moved to No 1 Dumfries Close, I dont recall much about Little Furze, but I fondly remember Miss Hunt. The main memories I have of growing up in Dumfries Close was the michief and mayhem we caused, not malacious or violent , just high spirited naughty boys, its a shame but you would be prosecuted now for what we got up to…. Anyone remember Miss Hunt, think it would have been around 1959 when I was at Little Furze. I was Hudson back then. Lived on Holmside Rise. Can anyone tell me anything about the Yeomans,,Freemans,Merrills,Latimers,Angels ,Nangles(I remember that Mrs Nangle was a German war bride). In response to Val Pond. Val – my name is Peter Nangle and I was born in Ashburnham Close in 1959, I cannot remember the number but it was in the front bedroom. My mother (the German war bride) was in fact Greta who was from Lithuania (who hardly spoke any English). My father was Jack, my mother passed away in 1993 but my father is still alive. I have an elder sister Lena and an elder brother Paul, he passed away in 2007. I had another brother Derrick who passed away at 18 months old and he is buried in an unmarked grave in Vicarage Road Cemetery, close to the football stadium. I visited my house of birth around 2000 and paid my respects to my unknown eldest brother. Around 1961-2 we moved to Slough from Ashburnham. Unfortunately I have no memory of my place of birth but I’m over the moon that someone has remembered our name from such a long time ago. 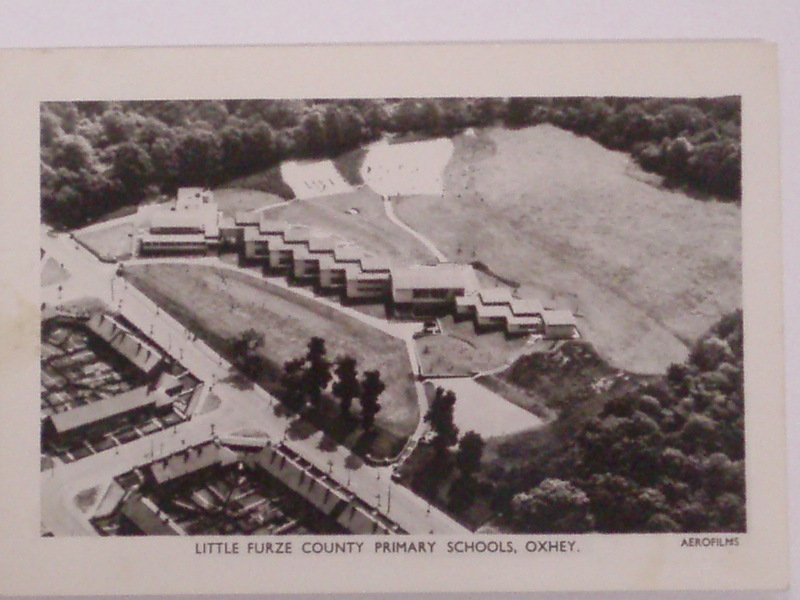 I started at Little Furze 1951/2 I remember a total eclipse and we all went in the playground looking through glasses we had made, does anyone else remember that? Our house was next to the Bluebell woods. I later went on to Hampden Secondary School. I emigrated to Australia in 1964 with my husband. I remember the name Peter Swain, perhaps we were in the same class?I started in 1951/2 & the school was brand new. I also remember the name Barbara Bush. Can anyone tell me anything about the Yeomans,,Freemans,Merrills,Latimers,Angels ,Nangles(I remember that Mrs Nangle was a German war bride).My mum ran a Sunday School in Ashburnham Close and was herself a war bride from South Africa. We owned a fridge a motor bike and side car and folk thought we were rich! Hello LSK I’m glad you recall happy days at school and visits to our home in Hayling Rd to watch television. Mum died aged 50 in ’73 and Dad in ’79 aged 67. I now live in Exeter and John is in Durham. Have just read the 1st day comments. I can remember Sergeant Swain, Mrs Swain, John and Peter. If I was very lucky I could watch Mr Pastry on their black and white television. The Alsatian was big and very friendly. I started at Little Furze in 1956, just before my fifth birthday.The little hall for the new entrants had a mural which has stuck in my mind for ever. The Principal was Mr Curling. We had pictures next to our coat hooks which were chosen for us. I can remember little willows and the paddling pool. The teacher was a bit gruff. Other teachers in the senior school were Mrs Jones; Mrs Michaels; Mrs Phillips and Mrs Davies. I also remember Mr Jones who used to slam the doors and break the windows. We sat the 11+ in our class rooms. The school dinners were served in the dining room next to the junior school hall. They cost 2s 6d a week. We had dinner ladies that used to supervise us in the playground. I can remember having egg and spoon races and sack races in the summer. We also got a Maypole and were taught maypole dances. Still remember my green blazer with the Little Furze tree. I’m a psychologist now and I suppose it all started with my learning at the school. My now husband and I started Little Furze in 1960-61, we were 4 or 5, our teachers name was Miss Skeats, she was lovely. We subsequently continued on to Sir James Altham school, and went on to marry in 1977 Silver Jubilee week-end, which means we will have been married 35years on the week-end of the Diamond Jubilee 2012. I started in 1962 I remember the willow trees by the infant playground and there was a row of popular trees dividing the other two playgrounds. I started in the ground floor classrooms and then moved to the single story classrooms. the ground floor classrooms were taken by the disabled school, they built a swimming pool by the dinning room . I started at Little Furze in 1968. I remember that there were 2-3 Willow trees on the grass area to the north (in the photo) of the infant playground. There was also a number of Willow trees behind the main block (where the hall and offices were situated). When I attended the school, the trees were quite mature. There are a couple of dark spots on the photograph that could possibly be planted saplings. Although Willow trees are fast growers I would guess that the photo was taken at least 10 years prior to me starting school. There are other areas of the school grounds where there was mature tree growth when I started at the school which are bare in the photograph so my guess is that the photo was taken at least 10 years before 1968. Although I have no recollection of it, I’m reliably informed that the oblique aerial photograph was used as an illustration on a Christmas card in the 1960s. Judging by the apparent newness of the site and the lack of motor vehicles on the adjoining roads, I would hazard a guess and suggest the picture was taken in the summer of 1953 (Coronation Year). The main school only opened in September 1952.